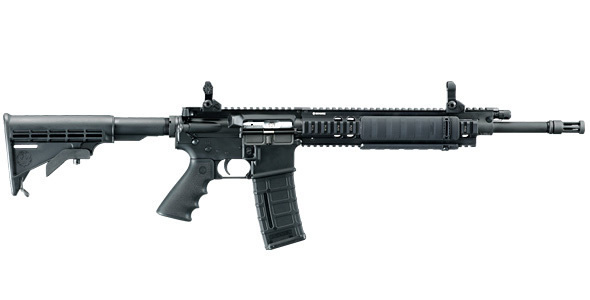 Ruger SR-556 Gas Piston/Op-Rod AR Carbine User Feedback: Case Extraction Problem and Solution. | DefenseReview.com (DR): An online tactical technology and military defense technology magazine with particular focus on the latest and greatest tactical firearms news (tactical gun news), tactical gear news and tactical shooting news. Well, two days ago (8/24/09), Defense Review member “biggun” posted a comment to our article about a problem he’s been experiencing with his brand new SR-556, a problem that, according to him, persists even after sending the gun in for repair/service. Click here to read what “biggun” posted about it in the “Comments” section below the article on 8/24/09. Upon reading “biggun’s” post, DefRev contacted our friend and professional contact John Fawcett, and asked him to do his best to describe what he thinks in his professional opinion might be causing the described case-sticking/rim-ripping extraction problem without actually having an SR-556 in his hands. John was kind enough to write back and describe the likely problem and the solution. According to him, it should be an easy problem to fix, provided Ruger repair/service personnel AND the end-user both understand what’s happening and how to fix it on their respective ends. The issue that has been described to me is the failure to extract a fired round. 1. Overgassing the system and speeding up the action of the bolt/carrier assembly. This caused the timing to be off! The bolt unlocks before the case has relaxed within the chamber. 2, A rough chamber or poor chamber geometry which puts extra pressure on the case wall. This will exert more stress on the rim and cause its failure. A sub-part of this is the use of polymer coated ammo. If the gun is hot, and a polymer case is left in the chamber..it welds it self in as the polymer melts between the chamber wall and the case. 3. A mixture of each of the above situations. Since th gas system of the Ruger is “User Serviceable” It creates it’s own issues. If the user does not understand the system, it is common for the operator to keep playing with it. My guess ( Without actually seeing the problem) is that the gas piston is set to a larger opening. This is allowing the system to overspeed the carrier and rip the rim from the case. It is an easy fix though. Examine the chamber under good light and magnification and polish the rough areas. Then set the gas block to the lowest setting and go through the process. A few things in Ruger’s defense: 1) This may be an isolated case. If it isn’t, and other Ruger SR-556 owners have experience the same or a similar problem, DefenseReview would like to hear from you. 2) The SR-556 is a brand new product offering, and teething problems are common and to be expected with ANY new semi-auto or full-auto weapon. And 3) Steel-cased Wolf ammo can sometimes cause extraction problems and stuck cases once the chamber starts getting really hot. Defense Review has personally experienced this while firing a direct-gas-impingement (DGI) FERFRANS SOAR SBR/subcarbine. During our (SOAR) firing session of approx. 1500 rounds, one (1) Wolf 5.56mm/.223 Rem. cartride case practically welded itself to the chamber after firing due to the extreme heat generated by heavy full-auto fire, and we had to hammer it loose with a cleaning rod through the bore. It was an isolated ammo-caused problem, specifically caused by the Wolf ammo’s lacquered steel case. The combination of the steel case, lacquer coating, and intense heat caused some serious case stickage in the chamber. However, this shouldn’t really happen during semi-auto-only fire, even after rapid-fire strings, and it especially shouldn’t happen with multiple brass-cased ammo brands.